On the 31st of March 2017 the senior boys set out for the annual Lucan Sarsfields boys senior blitz. Mr. Kirwan was looking after the team and our first match was against Divine Mercy. We had high hopes of winning this game. The opening score was by Daniel Kane followed by Niall Higgins, Robert Keher and Kevin Gormley. Killian Gormley also produced some magnificent saves and we won the game after a late rally from Divine Mercy. 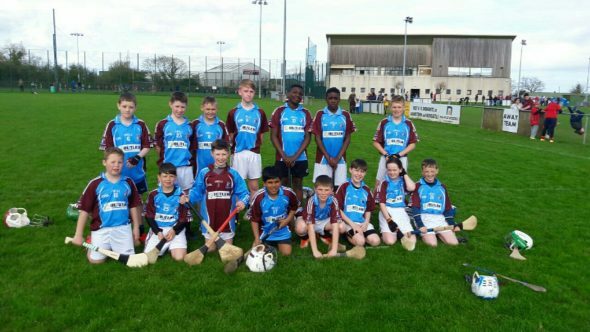 Our next game was against Gaelscoil Naomh Padraig where Max Hennessey grabbed an early goal. Tommy Mulhall was man of the match but sadly we lost after a great performance. Our final game in the group was against Griffeen Valley Educate Together. In the first half there were a number of scorers with Niall Higgins, Daniel Kane and Robert Keher getting their names on the scoresheet. Some amazing defending from Darlington Odia kept us in the game but unfortunately we lost the game after conceding late goal. We qualified for a final against St. Mary’s BNS B team. In the first half Kevin Gormley scored a great goal, but in the end the BNS were the better side. Thank you and well done to everybody who participated in the blitz. A special mention to Niamh Roche who had a great blitz.